Instead of hanging an American flag as part of your wall decor for college, bring a unique dorm supply like this Don't Tread On Me Tin Sign. 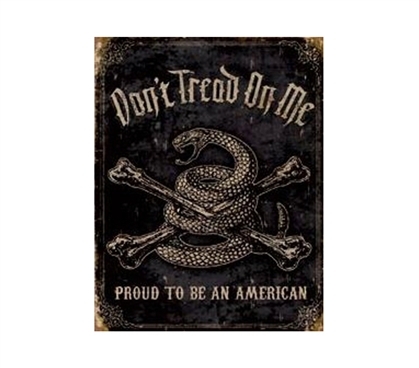 This college product provides a very cool historical means of showing your patriotic side. Unique dorm items are the sort of college supplies that help to really define your dorm room. After all, you'll have to have so many dorm essentials and college necessities, so when it comes to choosing your dorm decorations, you can really display your personality and pick some different sort of college items. With that in mind, college tin signs are the perfect dorm room supplies. So have some fun while decorating your dorm room and make sure you make that living space feel like your living space.